Judge Allows Brother of Fla. School Shooting Suspect to Move to Va.
NBC 6's Steve Litz reports on Zachary Cruz's relocation hearing. The brother of Florida school shooting suspect Nikolas Cruz will be allowed to move to Virginia where a full-time job awaits him, a judge ruled Friday. 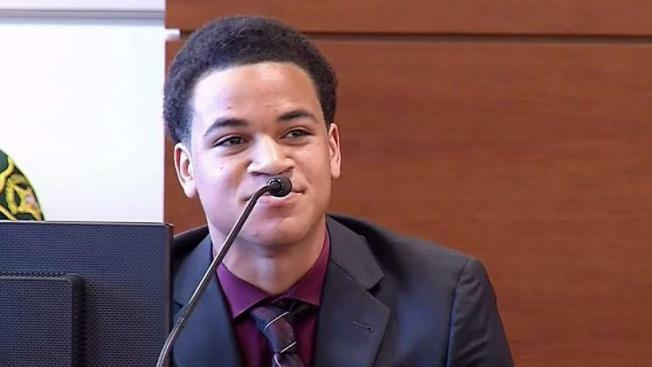 Zachary Cruz arrived in a Broward County courtroom Friday morning after lawyers for the 18-year-old filed a motion Thursday saying Cruz has been offered a free home for one year in Staunton, Virginia. Cruz took the stand shortly after 9:30 a.m., asking Judge Melinda Brown to alter the terms of his six months' probation for trespassing at Marjory Stoneman Douglas High School, which requires the court's permission to leave. "I have an opportunity there that I don't have here," Cruz said. The judge said she would allow the teen to move, telling him, "You need to just take this moment and appreciate what they're offering you. Make wise choices." Cruz, who has been living in a hotel in South Florida, said he will head to Virginia on Saturday. "I'm very happy with the court's ruling and I'm looking forward to starting a new life in Virginia," Cruz told reporters after the hearing. Cruz will still have to wear an ankle monitor under the terms of his probation and face a host of other restrictions including no possession of weapons or ammunition, no drug or alcohol use and no visits to any school unless he is enrolled there. The motion says Zachary Cruz would be hired as a maintenance mechanic paying $13 an hour. His job and living quarters would be provided by Nexus Services, which the motion says specializes in helping people adjust after prison or treatment. Attorney Mark Lowry said the move to Virginia will give Cruz a chance to live a relatively normal life and escape the shadow of the Stoneman Douglas shooting. Nikolas Cruz has confessed to the Feb. 14 shooting at the Parkland school that killed 17 people. His lawyers say he would plead guilty in exchange for a life prison sentence, but prosecutors are seeking the death penalty. "Mr. Cruz is not his brother. He is not charged with what his brother is charged with," Lowry said. "This gives him a chance to start over. A fresh start." Prosecutor Sarahnell Murphy closely questioned Nexus officials at the hearing about the level of supervision Zachary Cruz would be under, how he would get around and what kind of mental health counseling would be available. The Nexus officials assured her they would keep close tabs on him and ensure he met all requirements of his probation, including electronic monitoring of his whereabouts. Still, Murphy said she was concerned he was leaving Broward County's jurisdiction. Prosecutors have previously noted Zachary Cruz's own scrapes with law enforcement and said many "red flags" exist with him that were apparent with his brother after the shooting. "I wish I could say I was without trepidation," Murphy said. Then she added. "The state of Florida wants nothing more than for Mr. Cruz to be successful."